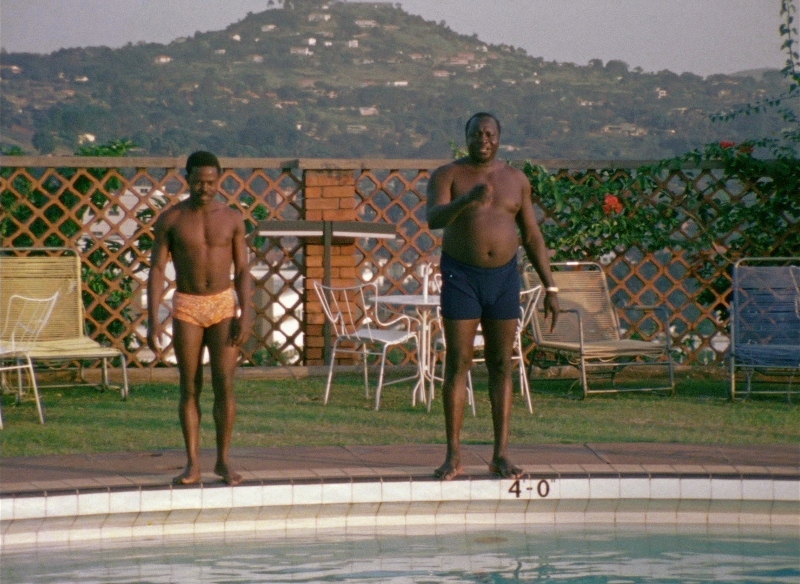 Filmed during a perfect storm of horrific circumstances, Barbet Schroeder's General Idi Amin Dada: A Self-Portrait (1974) remains one of the most subversive and sly documentaries ever conceived. The celebrated film director---who only made one other documentary that decade, 1978's Koko: A Talking Gorilla---turned his lens on vicious, charismatic Ugandan dictator Idi Amin during the height of his regime's power, which resulted in the deaths of well over 100,000 civilians. 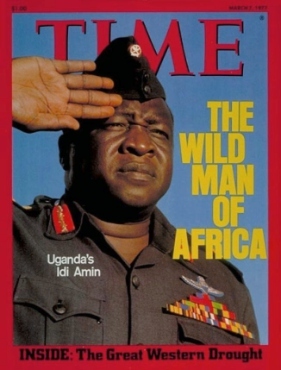 What's more is that Idi Amin was made with the self-imposed President's full cooperation: Amin envisioned a celebration of his leadership, technically co-directing it while supplying his own accordion music for the soundtrack. And then, like all self-aware interviewers of horrible people, Schroeder simply gave Amin enough rope to hang himself. The director---along with his late, great long-time collaborator and cameraman, Nestor Almendros (Days of Heaven)---was granted full access to Amin's daily life, or at least the version he wanted to show on camera. Certain events were obviously staged for the documentary; Amin's natural charisma bolstered many scenes of public adoration, even when we know what really happened off-camera. Yet the seams of his stability show in almost every visible thread: open disrespect for cabinet ministers, boorish arrogance, following God's instructions, and the horrific suggestion of executions for dissent. Perhaps the biggest turning point occurs just after the 30-minute mark: a cabinet meeting that barely eats up 15 minutes of screen time, but feels almost unbearable once Amin's true intentions are made known to the nervous attendees. Originally, two cuts of General Idi Amin Dada: A Self-Portrait were made by Schroeder: an abridged 60-minute version for Amin himself, and a longer international cut with additional scenes and narration (most of which identified certain events as staged, described the fate of at least one disobedient cabinet member, and other bits of commentary). 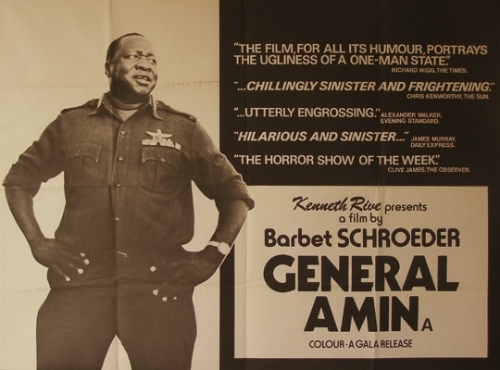 Upon learning of this longer cut, Amin demanded that Schroeder trim at least three minutes of "offensive footage"...and just to emphasize his point, Amin imprisoned nearly 200 French Ugandan citizens until the director finally complied. 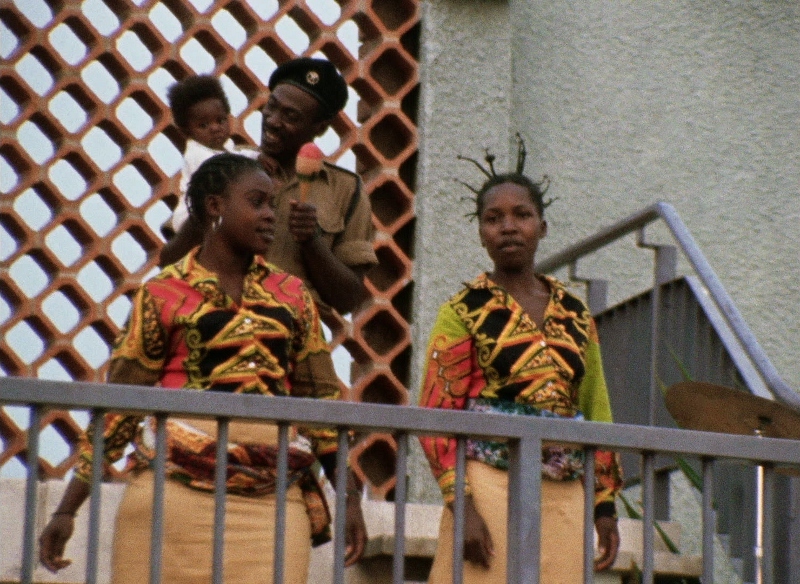 After Amin's exile in April 1979, the original full-length cut was immediately restored for public release. The disgraced leader took up residence in Saudi Arabia for most of his life's remaining years, eventually dying of kidney failure in July 2003. General Idi Amin Dada: A Self-Portrait is an extremely important and effective documentary, but only due to its subject matter. Like Koko: A Talking Gorilla, it's not exceptionally crafted, while the reality of Amin's genocide makes it about as enjoyable as Night and Fog. Both problems are forgivable under the circumstances, which makes Idi Amin a film worth witnessing at least once; if nothing else, it highlights the appalling dangers of unchecked political authority and ego. Criterion's Blu-ray aims to replace their own 2002 DVD, with a sparkling A/V presentation and two short new supplements. It's not their most thoughtful or well-rounded release...but at least the timing is pretty good, right? General Idi Amin Dada's rough and rugged 16mm roots ensured that it even looked great on DVD, but this new director-approved 2K digital transfer certainly represents a solid improvement across the board. Its source material has obviously been treated with great care; the result is a very film-like and pleasing image with excellent color saturation, pronounced fine grain, and deep black levels. 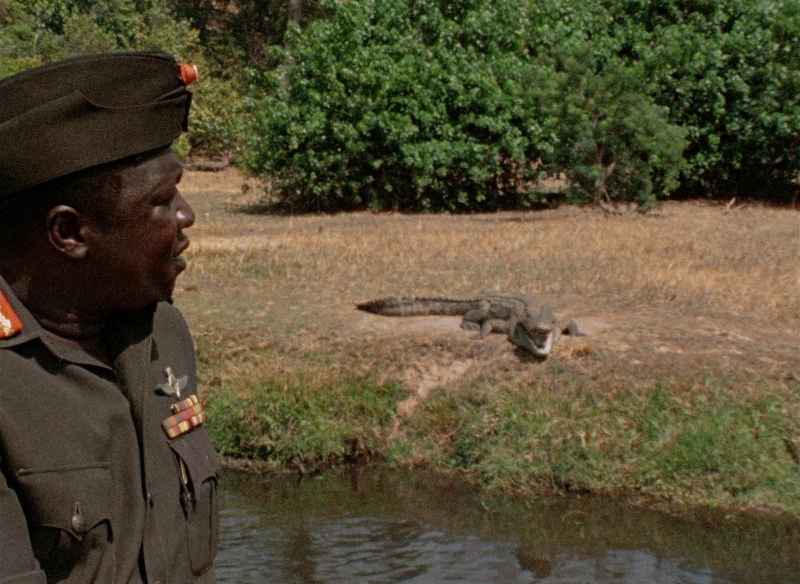 The film's color palette, unlike the majority of most Criterion Blu-rays, actually displays a more noticeable reddish-brown hue rather than leaning towards cyan or green, which suits Idi Amin's atmosphere perfectly and gives it a warm, natural appearance. Though I'd imagine that most casual fans might not appreciate the subtle---or not-so-subtle---improvements on display here, this is a great-looking transfer from top to bottom. As expected, the film's lossless PCM 1.0 mono track plays it straight and delivers a strong, stable audio experience. There are very few muffled segments of dialogue or other source flaws considering the production's circumstances; all too often, documentaries sacrifice quality for the privilege of being "in the moment", but what's here sounds well-balanced and perfectly fine within source limitations. Optional English subtitles are included during the main feature only. As usual, Criterion's menu is smooth and easy to navigate. This disc is locked for Region A players only; it's packaged in Criterion's stocky keepcase with terrific two-sided cover artwork. The fold-out Booklet includes notes about the restoration, production photos, and an essay by film critic J. Hoberman. A transcription of requested cuts made by Idi Amin after he viewed the film was originally printed in the DVD booklet, but sadly doesn't seem to be included here. Two new supplements are included on Criterion's Blu-ray: recent Interviews with director Barbet Schroeder (12:35) and journalist Andrew Rice (15:49) concerning the film's production and legacy, as well as an overview of Dada's regime during the 1970s. Other topics of discussion include its cultural impact, alligator pits and the fate of a few supporting characters, Uganda's path towards independence in 1962, Amin's Army service and rise to power, and the bloody fallout. This is a fairly good pair of interviews, but it doesn't make Idi Amin worth an upgrade on its own for obvious reasons. One additional extra has also been ported over from Criterion's 2002 DVD: a 2001 Interview with Schroeder (26:44), which goes into detail about the unique challenges and dangers associated with filming such a documentary. A text-based timeline of Ugandan history has not been carried over, but the second new interview takes care of all that. Barbet Schroeder's General Idi Amin Dada: A Self-Portrait is a fascinating slice of cinema, offering a rare look behind the curtain at one of the 20th century's greatest villains. Unofficially co-directed by Idi Amin himself, Schroeder's documentary gives the dictator more than enough rope to hang himself and the result is a darkly comic---but chillingly horrific---piece of subverted propaganda. It's certainly not for everyone and not exactly enjoyable in a traditional sense, but its place in film history can't be ignored. Unfortunately, that doesn't exactly make Criterion's new Blu-ray worth an upgrade: it's 2K-sourced A/V presentation is great, but the new extras are underwhelming and it should've been priced accordingly. Die-hard fans can still consider this disc mildly Recommended, but all others should rent it first.